On Wednesday, President Donald Trump widely criticized Canada. 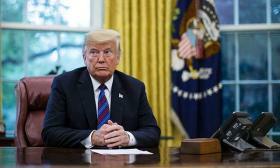 UNITED NATIONS, N.Y. — U.S. President Donald Trump let Canada know how he really feels Wednesday — sharpening his tariff threat, calling out Chrystia Freeland and claiming he denied Justin Trudeau a bilateral meeting, all because of the federal government's hard bargaining on North American trade. Trudeau said Thursday he didn't request a meeting with Trump. Trudeau also said the Americans are finding NAFTA talks difficult because Canadians are "tough negotiators” and won’t agree to a bad deal. But the president didn’t just criticize Canada, he went to threaten his northern neighbours. He reiterated his threat to slap punitive tariffs on Canadian auto imports to the U.S., a both-barrels tactic experts on either side of the border have warned would devastate the industry. "Frankly, we're thinking about just taxing cars coming in from Canada," Trump said. "That's the motherlode, that's the big one. We're very unhappy with the negotiations and the negotiating style of Canada." And then, for good measure: "We don't like their representative very much." That appeared to be a reference to Foreign Affairs Minister Chrystia Freeland, a former journalist and careful tactician whose star turn in Trudeau's government has earned her deep respect in the Liberal caucus and beyond. Trump and Trudeau have spent little time together since the G7 gathering in Quebec, although they have spoken by phone. Earlier Wednesday, Trudeau appeared to give a gentle nudge to the president's trade ambassador, saying Trump had insisted repeatedly that punitive American tariffs on steel and aluminum wouldn't be an issue under a new NAFTA. Trump has said "a few times" that a new deal would mitigate the tariff issue, the prime minister said. "We are continuing to work on getting to a right deal for Canada, a right deal for Canadians. And that involves, obviously, feeling confident about the path forward as we move forward — if we do — on a NAFTA 2.0 and the ... lack of punitive tariffs that we consider are unjust," Trudeau said. Observers say the patience of U.S. lawmakers is waning, particularly with a good deal with Mexico on the table. Supporters of Mexico's incoming government, which takes office Dec. 1, are not especially fond of NAFTA, which is why both countries want the deal done before then. Trudeau's interactions with the mercurial U.S. president have been a subject of great curiosity over the course of his three days at the General Assembly. First, there were the comments from U.S. national security adviser John Bolton, who suggested Monday that requests for a bilateral meeting "couldn't be accommodated." Officials in the Prime Minister's Office insisted no such request had been made, given already close contact with the White House. "I love Canada, by the way," he said. "I have so many friends ... but that has nothing to do with this."